ALL CANDY IS MADE TO ORDER. ALL ORDERS WILL TAKE AT LEAST TWO WEEKS. MOST ORDERS WILL TAKE LONGER. To ensure your order by the delivery date please call or email me. Any order bigger than 20 requires AT LEAST three weeks or longer. 2 weeks (All orders of 20 or less will take at least this long) Please email me if needed sooner. 3 weeks (Depends on the size of your order) Enter the date needed below. 4 Weeks (Depends on the size of your order) Enter the date needed below. At least 5 weeks (Depends on the size of your order) Enter the date needed below. To ensure your order by the date needed please email me or call me. ENTER THE EXACT DATE NEEDED. If you do not enter the date below candy will be made in the order that your order was received. Below are our standard colors, if you want your item to have specific colors in places not shown in the picture please select the colors and specify where on the item you want the color to show up. This is only neccesary if changing something. This area is only if you are changing any of the colors as shown. Tell me where you want your color choices that are different from the picture. For instance - as a general example: Nose: Black, Lips: Pink etc. I have a special request for a color choice and placement. I understand that all colors cannot be accomodated, but I am asking anyway:) I understand that if the color choice is not available another color close will be chosen for me. 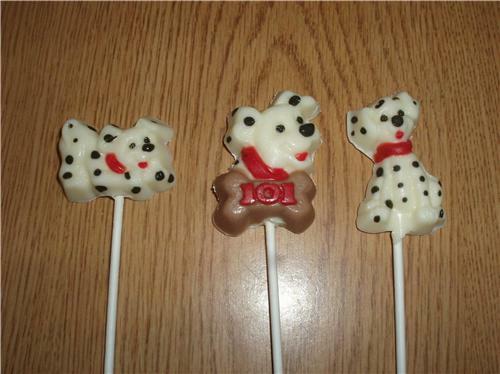 You are looking at a picture of some 101 dalmatian lollipops. These lollipops are made from chocolate and are all handpainted. You will receive one lollipop of your choice. This candy is made fresh to order and comes in bag tied with a pretty colored ribbon. These would be very cute for your childs birthday party. PLEASE BE SURE TO READ OUR IMPORTANT CANDY INFORMATION PAGE AT THE BOTTOM OF THE PAGE.